(Newser) – Looks like NBC management wasn't as impressed with Al Roker's record-breaking 34-hour weathercasting marathon as the rest of the world. NBC brass recently held an "Al Roker intervention" to tell the Today show weatherman to tone it down and stick to deciphering the Doppler after a series of "classic Roker-isms," as Page Six puts it. A source says that a meeting was held because "he was saying weird things and becoming too idiosyncratic. They asked him to act more like a traditional weatherman." 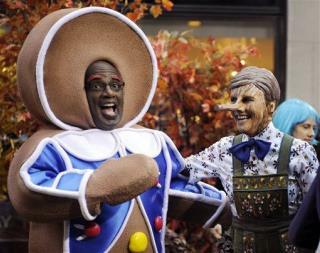 According to the same source, Roker took it like a professional and is "playing ball." Sorry some of us have to go to work instead of watching him. Somehow Im not really missing anything I guess. I don't watch him and don't know his schtick, but I can see the network going into a panic over the slightest deviation from their "scientifically" determined broadcast format based on focus groups, opinion polls and ratings... in other words; news content dumbed down as to appeal to the widest possible viewership. The last thing advertisers want (or need) is a black Howard Beale going off script.